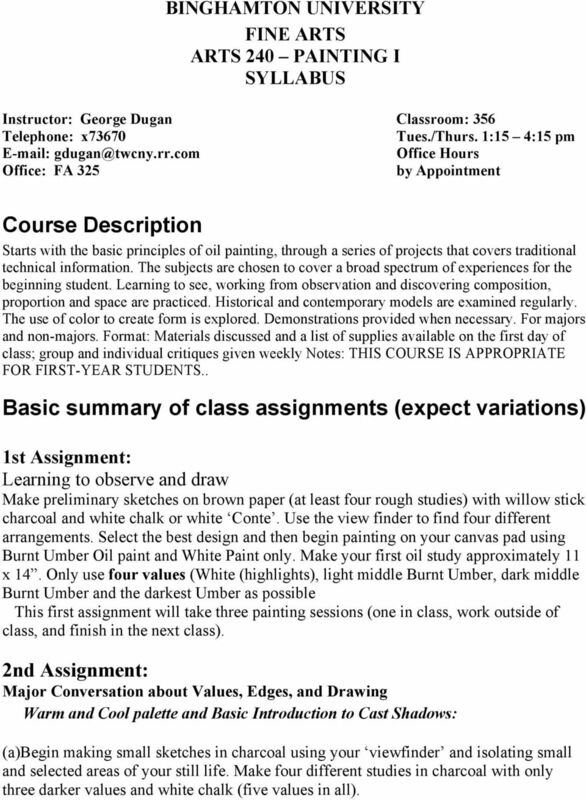 Download "Basic summary of class assignments (expect variations)"
1 BINGHAMTON UNIVERSITY FINE ARTS ARTS 240 PAINTING I SYLLABUS Instructor: George Dugan Classroom: 356 Telephone: x73670 Tues./Thurs. 1:15 4:15 pm Office Hours Office: FA 325 by Appointment Course Description Starts with the basic principles of oil painting, through a series of projects that covers traditional technical information. The subjects are chosen to cover a broad spectrum of experiences for the beginning student. Learning to see, working from observation and discovering composition, proportion and space are practiced. Historical and contemporary models are examined regularly. The use of color to create form is explored. Demonstrations provided when necessary. For majors and non-majors. 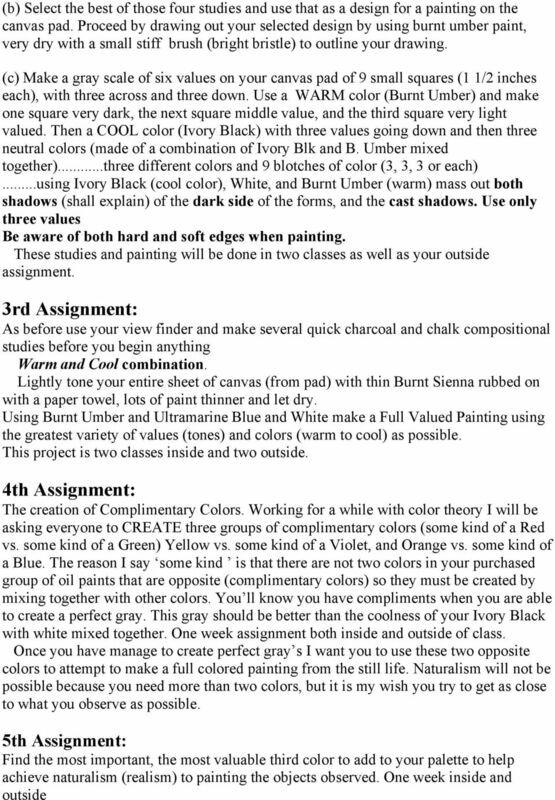 Format: Materials discussed and a list of supplies available on the first day of class; group and individual critiques given weekly Notes: THIS COURSE IS APPROPRIATE FOR FIRST-YEAR STUDENTS.. Basic summary of class assignments (expect variations) 1st Assignment: Learning to observe and draw Make preliminary sketches on brown paper (at least four rough studies) with willow stick charcoal and white chalk or white Conte. Use the view finder to find four different arrangements. Select the best design and then begin painting on your canvas pad using Burnt Umber Oil paint and White Paint only. Make your first oil study approximately 11 x 14. Only use four values (White (highlights), light middle Burnt Umber, dark middle Burnt Umber and the darkest Umber as possible This first assignment will take three painting sessions (one in class, work outside of class, and finish in the next class). 2nd Assignment: Major Conversation about Values, Edges, and Drawing Warm and Cool palette and Basic Introduction to Cast Shadows: (a)begin making small sketches in charcoal using your viewfinder and isolating small and selected areas of your still life. Make four different studies in charcoal with only three darker values and white chalk (five values in all). 3 6th Assignment: Create a palette of three PRIMARY COLORS, and make then into full intensity (saturated). Observing the still life, paint four 5 x 7 studies. Inside and outside of class 7th Assignment: The Dead Color Palette: White, Blue Black, Yellow Ochre, Burnt Sienna, Raw Umber. The name Dead Palette is not very attritive as this palette is far from dead. This group of colors were used by all the major Old Masters. With intelligence and discipline you could create an impression of a full wide range of color variety. Maybe this will be the most important lesson about color that you will learn working with this palette. This painting should appear as a full color painting. Two weeks both inside and outside. 9th Assignment: Working on a stretched canvas 16 x 20 You should create an Under painting of the selected subject matter. First tone the canvas with thin transparent paint and allow it to dry. Then proceed to paint the entire painting in Monochrome (English Red) using the paint very dry and creating values by how much you thin out the paint (I ll demonstrate). Once the entire composition, drawing, edges, and values are established beautifully you ll begin to use the Dead Palette to paint opaquely over top to create a full colored painting. 2 weeks 7th Assignment: Pointillist Painting Working on a small scale approximately 5 x 7 and creating the best primary colors that you can create make a painting using small dots so that they are optically mixed (demonstration). One full week 8th Assignment: A series of 6 Alla Prima Paintings approx 7 x 10 9th Assignment: New Still life Working with the entire group of colors and on a 16 x 20 stretched canvas make the best painting you can within the confines of two weeks. Plan out your design, do value studies, make sure your drawing is solid and in proportion. Concentrate on the variety of Edges, Values, and Drawing. Plan all of these things by developing your under-painting. Try to record the best colors observed. Two Weeks. 4 10th Assignment: Final Masterwork Set up your own Still Life and begin to work independently. Conversation about the final Master Work What you See is What You think! Summing Up! The Final Project For the last class, this is when the final project will be presented in class. PAINTING #1...on canvas One completed painting done in both Glazing and Scumbling. This painting is to be Under Painted in Indian Red, or Burnt Sienna, or with Transparent Red Oxide or Orange. Attempt your very best to execute this work by demonstrating, (A.) very good Drawing Skills (i.e. perspective), (B.) good Range of Values, and (C.) good Variety of Edges from soft and merging to very hard edges, (D.) Good observed Color, (E.) a well considered Design. You ll need to use the Liquin Medium or some other fast drying medium (I ll explain in class) so your work will dry quickly and therefore helping you to be able to proceed with the painting with a variety of layers of paint over top of the under painting. You will recall that throughout the entire semester I have been stressing these three principles: (Drawing., Value, Edges). 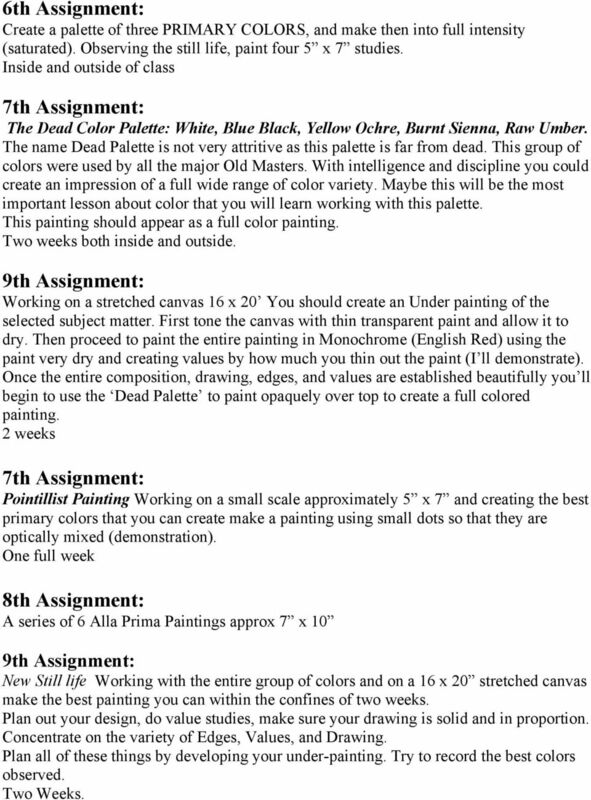 This painting being the very last one will be a good opportunity to demonstrate your understanding, and application of these principles as applied into your final project. I have explained that I grade on attendance, effort, and growth. The Final is a great time to demonstrate this GROWTH, and EFFORT! If you wish to do several different paintings at the same time (meaning...picking one up, and working on that for a little bit, and then switching to another painting to also work on that...this will be o.k.) Painting #2. The Final Painting: 1. Before you begin the last painting 18x24: done on canvas I want you to plan out your design by doing some preliminary studies in full color. These are to be approximately 5 x7 and done in full color (direct Alla Prima studies ). These do not have to be finished polished, or detailed at all. I want you to use this to to figure out a game plan for your final design. Maybe one study is done looking at a specific view point, and the second an entirely different angle. The third using the format on the vertical and the next on a horizontal, etc. Use your viewfinder! The Studies before the FINAL PROJECT...this will need to be explained in detail inside of class. 5 2. I want you to add into these color studies a different color into each of the colors. For example... To explain...lets say you have decided to add yellow ochre into all of the colors on your palette. So...you take some Ochre, and squeeze some out into your white, into your yellow, into your green etc. Each color has some ochre in them. Then move on to the second study...this time you might choose to add red into all of the colors. After you have completed the four 5 x7 studies with these differing colors added, I want you to stand back and make a decision as to which color that you want to add into your final painting. 3. The final 18x24 canvas. Begin by toning your surface with thin paint. Do this with a color that is sort of the theme color of the area that you have selected to paint. Then begin drawing out your composition (roughly) with your charcoal. Please make sure to draw all the shadows that exist in the composition. AGAIN...measure (rule of thumb) drawing as well as you can draw (perspective) and then carefully draw all of the SHADOWS clearly. Try to keep this stage of your painting/ Drawing as clear flat shapes. Next...take our some Raw Umber,,,,,and begin by painting in all of the darkest areas first (including the shadows). You can wipe this off if the values or drawing is not exact. Draw out in Raw Umber (the dark areas) with clear definitions and thin flat paint. 4. 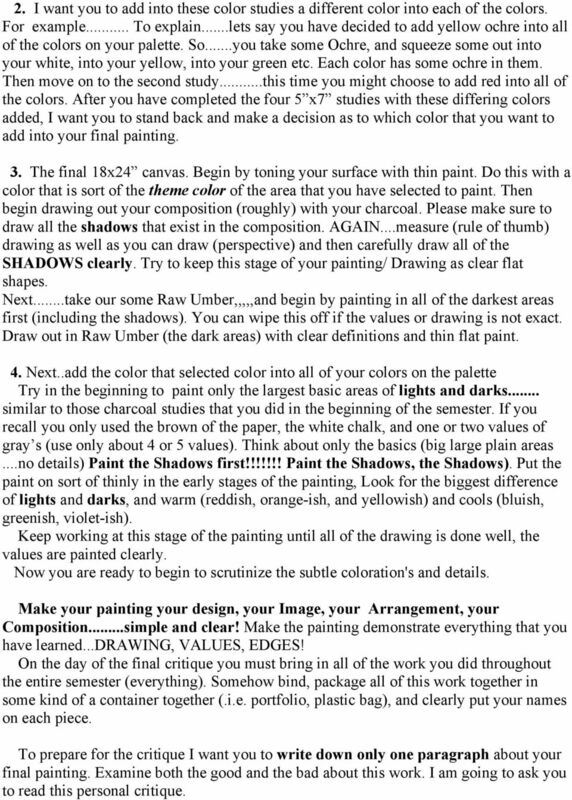 Next..add the color that selected color into all of your colors on the palette Try in the beginning to paint only the largest basic areas of lights and darks... similar to those charcoal studies that you did in the beginning of the semester. If you recall you only used the brown of the paper, the white chalk, and one or two values of gray s (use only about 4 or 5 values). Think about only the basics (big large plain areas...no details) Paint the Shadows first!!!!!!! Paint the Shadows, the Shadows). Put the paint on sort of thinly in the early stages of the painting, Look for the biggest difference of lights and darks, and warm (reddish, orange-ish, and yellowish) and cools (bluish, greenish, violet-ish). Keep working at this stage of the painting until all of the drawing is done well, the values are painted clearly. Now you are ready to begin to scrutinize the subtle coloration's and details. Make your painting your design, your Image, your Arrangement, your Composition...simple and clear! Make the painting demonstrate everything that you have learned...drawing, VALUES, EDGES! On the day of the final critique you must bring in all of the work you did throughout the entire semester (everything). Somehow bind, package all of this work together in some kind of a container together (.i.e. portfolio, plastic bag), and clearly put your names on each piece. 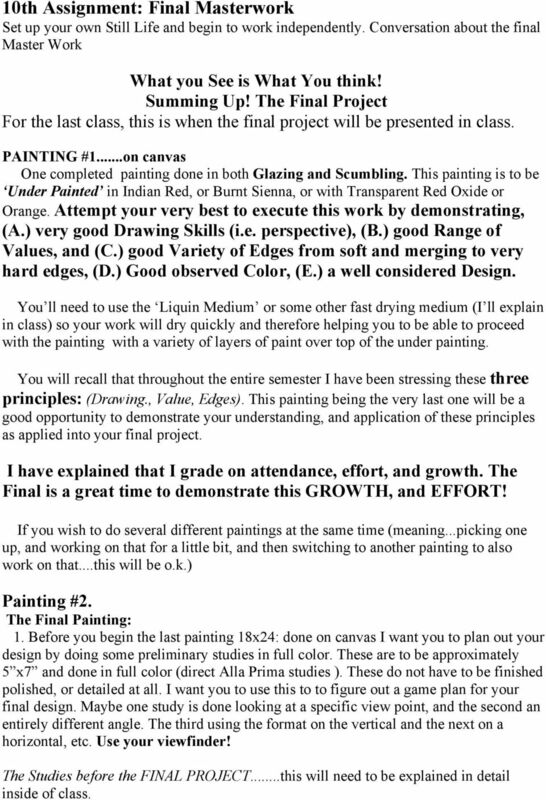 To prepare for the critique I want you to write down only one paragraph about your final painting. Examine both the good and the bad about this work. I am going to ask you to read this personal critique. 6 You ll have to leave the work after the class ends so that I can grade them. I will place the grade inside your portfolio, and then you can pick this work up on the morning of next day. COURSE DESCRIPTION Further development of technical/perceptual drawing skills, with emphasis on the human figure. Required for art majors. MEMORY BOXES Karen Chase 2006 TWO BOXES THREE TECHNIQUES I have designed these two Memory Boxes using basically the same pattern to show how different techniques and colors can change the look of a pattern. Textbook and/or Resource Material No textbook is required for this class. HOW TO STAIN & COLOUR ROCK FACES And a little bit on carving the rocks. HOW TO achieve true colors of nature IN YOUR OUTDOOR LANDSCAPE PAINTING (PLEIN AIR) SPRING AND SUMMER IS NEAR STEP-BY-STEP DEMONSTRATIONS BY SAM ADOQUEI 1st STAGE General Drawing, Simplify Everything. 1995 HI 26. There are two kinds of abrasives used in smoothing wood. They are steel wool and sandpaper. FLOR ARTS 1106 Beginning Oil Painting CAPA FLORENCE PROGRAM Course Description A studio art course at the beginning/intermediate level formulated to introduce students to the techniques of oil painting.